The MK Player360 is a VR projector that proves that users can enjoy immersive experiences without the need of a headset. Spanish company Broomx thinks the ultimate VR experience does not require a headset. Instead, total immersion can be achieved with a 360-degree projector that can be controlled via a smartphone app. The MK Player360 VR projection system is currently marketed to business-to-business clients pertaining to the real estate, health care, tourism, retail & exhibitions and cruising industries. The projection unit can connect to Google Maps or Google Street, so it can simulate a virtual tour of sites and cities – a useful feature for real estate presentations. According to Broomx COO Ignasi Capella, the projecting system can connect to other devices in a room. 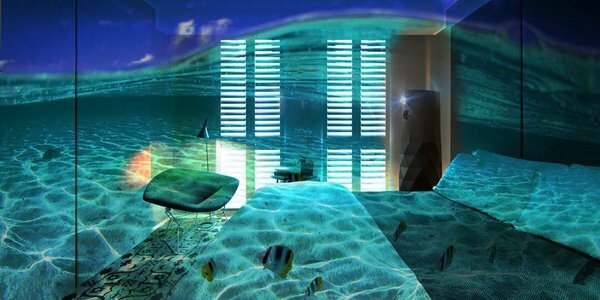 For example, the lights in the room can be synchronized to a blue mood for the images of an underwater scene, while the bed could move to simulate the movement of waves. Pricing information is unavailable at the moment. COO Capella says the projector is already available in Spain. but the company has ambitious plans to make the device available in the E.U. and the U.S. as well.